Ryan and I have 4 dogs, and at the risk of sounding crazy, they truly are our babies. Everyone says, “Just wait until that baby comes- those dogs will be dogs again.” That makes me sad. However, I’m not one of those people who treats their dogs like they are human- they don’t wear clothes, they eat dog food, etc. They are, however, a huge priority and caring for them takes a lot of time. Time I’m not sure I’ll have in a few weeks. So when Grayson arrives, yes, there will be some adjustment. I just hope they continue to know they are loved and are an important part of our family. Gabby- I’ve had Gabby the longest of all of them- I adopted her in March 2006 to be a playmate for my westie Pippi, who we lost Christmas Day 2007 (she got under the fence and we never found her- devastating). 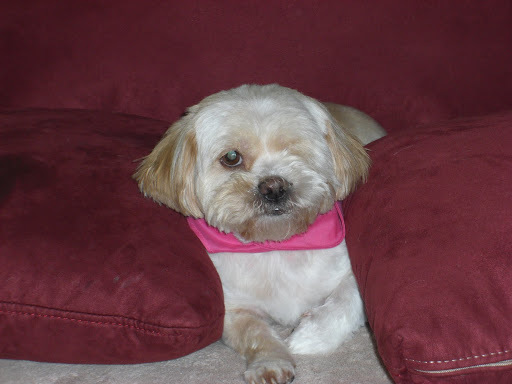 Gabby’s a cute little blonde lhasa apso with a pretty quirky personality. She sometimes wants to cuddle and be petted, but usually for just a few minutes- then she’s done. Most often she just likes to be near us- not touching us. When I adopted Gabby she had chronic dry eye that progressively got worse and worse over 2 years. We had her eye removed in August 2008 and it was the best decision. No more cleaning gunk from her eye and no more 3 times a day eye drops! And personally I think her one eye just makes her that much cuter! When Grayson comes, I think Gabby will just ignore him for the most part- until he’s mobile and wants to pull on her poofy tail. This picture pretty much says it all! Izzy- Oh, Izzy. Izzy is the most frustrating, demanding, stubborn, incorrigable little being- but I am so completely head over heels in love with her it’s ridiculous. Every time I see her she makes me smile- first of all she is SO cute (see photo evidence), but she also has the spunkiest, sweetest little personality to balance out her not so lovable traits. Izzy demands attention- if you are not completely focused on her or letting her sleep on your feet or stomach (under the covers always)- she’s not happy and she lets you know it with her high pitched, annoying chirp. 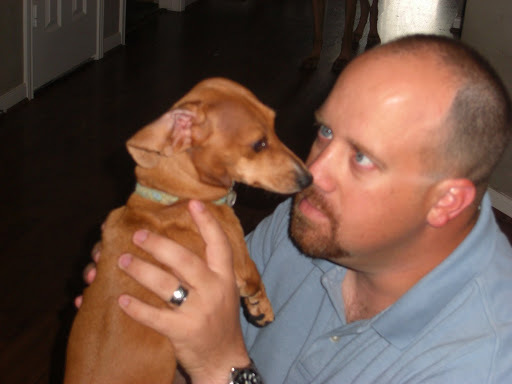 When Ryan and I got married, we decided no dogs in the bed with us. Well, guess who is the ONLY dog in our bed now? It took her a few months, but Izzy campaigned loud enough all night long every night that she now has her spot under the covers between her mommy and daddy at night. Sigh. Izzy is obviously the one I’m most worried about with Grayson-I can see her being very jealous of all the attention and time he’ll get (and she won’t). She won’t do anything to hurt him- I just think she’ll crank up her annoyingness a few notches- great. Hank- Hank is our loud, lovable goofball. Most people who meet Hank think he’s just a cool dog- and he is. Before we got Hank, Ryan always mentioned he wanted to get a bloodhound someday and name him Hank. Well, when we lost Pippi, for weeks I spent hours online posting ads on sites hoping someone would find her and contact us. 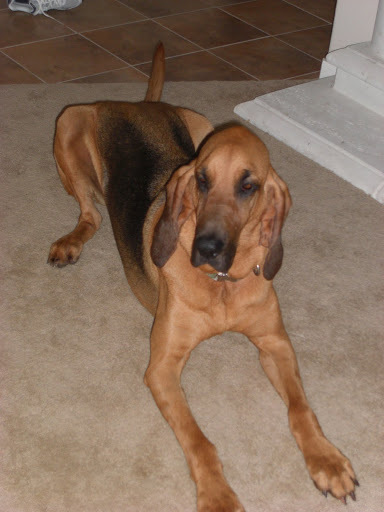 I spent a lot of time on petfinder.com and just happend to look up bloodhounds. There was his picture- and his name was Hank. It was fate. I forwarded the link to Ryan, mostly as a joke- as in, ha ha, I found your dog. Well, 2 or 3 days later we brought him home. Hank had been in an animal sanctuary for 7 months in an outdoor, uncovered kennel. He was skinny and starved for attention. We instantly fell in love with him. Hank loves people and most dogs, and he loves to run and play. Thanks to my job at Waggin’ Tails, he gets to run and play for hours most days, which is one of the biggest blessings in our lives. The fact that Hank could have been trained as a police search and rescue dog doing “serious” work just makes me laugh- like I said, he is just a goof. He spends most of his time at home inside, either sleeping or decorating our walls with his slobber. I can’t wait to see what kind of relationship Hank and Grayson will develop- I think they will be so cute together. And Hank is excited to have another dude in the house! Chloe loves to be comfortable! Chloe- Chloe is our little angel dog. When we lost Pippi, we got a call from a friend saying there was a little white dog wandering on their street. Knowing it was a long-shot, we went to see if it was Pippi anyway. No, but it was a sweet little Westie who immediately came to me and crawled in my lap wanting to be loved. I couldn’t NOT take her home- and she’s been with us ever since. Chloe is SO sweet and is the best behaved of the 4- she listens and obeys anything we ask her to do or stop doing. You can just look in her eyes and tell she wants to please you. I often wonder where she came from- if she had a loving family who wonders about her like I wonder about Pippi. 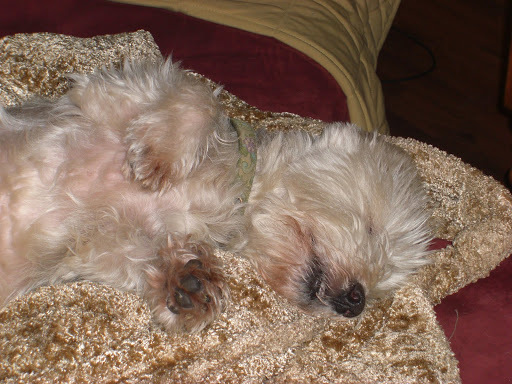 Sometimes though I think God sent her to me to help heal the pain of losing my first little Westie. Although she is so precious and sweet, I do worry about Chloe. She doesn’t like people in her face and has snapped several times (Ryan has a scar on his lip from when he got too close- poor guy was just sweet talking her, but she didn’t like that too much!) So she’s the one I think I’ll have to keep a close eye on with Grayson, especially when he gets old enough to get in her face. So that’s the story of my babies- if anyone has any advice for me on how to make their (and my) transition easier for when the human baby arrives, please let me know! I know it’s going to be a challenge, but they are here to stay and we WILL make it work!